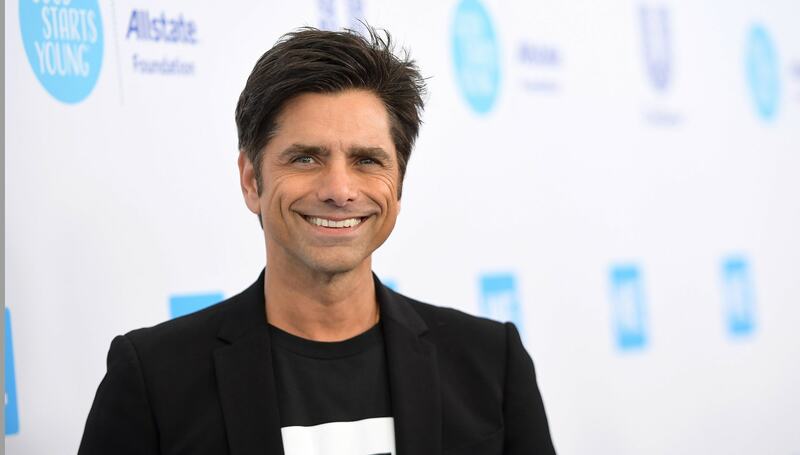 Fullest house ever: John Stamos introduced his 1-month-old son, Billy, to former Full House costars (and dear friends) Lori Loughlin and Bob Saget. Stamos shared the sweet moment on Instagram this Thursday. In the photo, Stamos holds tiny Billy in his hands as Loughlin and Saget melt all over the baby like candle wax. The best part? Billy's rocking a black onesie that says, "Jesse and the Rippers" on the back. If that sounds familiar, you're definitely a Full House fan. It's a very cute nod to the band Stamos' character, Uncle Jesse, used to play with. The caption is pretty darling too. “The Tin Man, Dorothy and The Scarecrow say hi to the cutest of Munchkins. #BillyandtheRippers,” Stamos wrote. Saget also shared the pic on Instagram with the caption, “~ So much love John. Most beautiful boy and Mommy & Daddy ever. So proud to be a new Uncle/Tin Man, my brother.” You guuuuuuuys. We'll just come out and say it, OK? We had kind of hoped Lori Loughlin and Stamos might end up together, and when Loughlin didn't show at John's wedding, we took it as a sign the two were star-crossed never-lovers. But it turns out Lori had prime Super Bowl tickets, which kind of trounces our romantic theories. Stamos' father apparently left quite a legacy. Stamos talked about him during an appearance at On Air with Ryan Seacrest. “I hope I live up to what my dad did," Stamos told Seacrest. "You know how you get to a point where you go, ‘My dad’s just a man'? I never got to that point. He was always bigger than life to me, so I’m happy to honor him with our little Billy." We have no doubt that Stamos is going to be the same kind of fantastic papa his own dad was. Clearly, all that TV uncle-ing totally paid off.